The day started out misty so we made it an exploring-by-bike day. It's quite useful to get the lay of the land on the first day. The whole peninsula is a cyclist's paradise with a plethora of cycle paths crisscrossing the flat terrain. We cycled to Prerow and loved it's cute thatched houses. We walked along the pier and then enjoyed fat bratwurst in a bread bun from a beachside vendor. 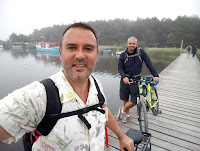 We carried on cycling to the National Park on the north-western tip where the lighthouse was just visible in the mist. As we started heading back towards our campsite the sun started to peep through the clouds and so we ventured from the cycleway, over the dune to the beach where we dozed for an hour or so. Our final pit stop was Netto to replenish the stocks of wine and beer with as much as we could carry between us in our rucksacks. It's May half term and for several weeks our plan was to visit the small island of Noirmoutier off the Vendee cost of France. As our holiday got closer and we began looking at the long-range weather forecast we were disappointed to discover we'd have a whole week of thunderstorms. The rest of France was expecting the same. Fortunately we hadn't booked the campsite and so our plans could be changed. 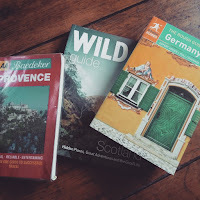 We carefully checked the weather many times and I even started researching Denmark or considering the possibility to write off our Eurotunnel crossings and go to Scotland. On Thursday, the evening before we were due to travel, we decided the south of France was worth a risk. We'd have rainy portions of a couple of days but otherwise the forecast had improved somewhat, and so we planned to drive to Provence. On Friday morning I looked once more at the weather outlook to find it was back to five days of rain. It was back to the drawing board.